Noticing more foreclosures hitting the market? Have you started to notice a few more foreclosures lately? Let’s talk about that and interpret what is happening. Take a look at the graphs below and then let’s consider a few points. Sifting Numbers Carefully: The percentage of foreclosures has technically increased lately. However, the most important thing to look at is the number of foreclosures. 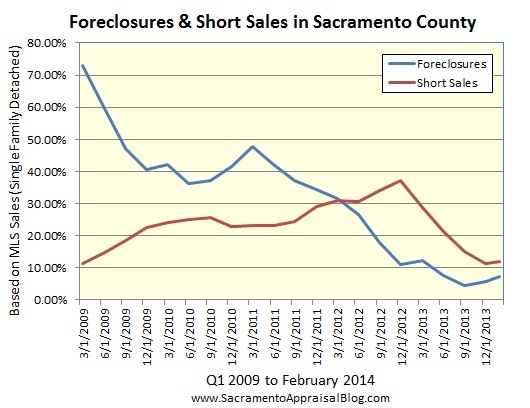 Since sales volume has been very sparse these past few months in Sacramento County, and foreclosure sales have been more consistent during that time, this naturally gives foreclosure figures a boost for the overall percentage of the market. For instance, we saw a 1% increase in foreclosures from Q3 to Q4 2013, yet we saw the same amount of foreclosures during each respective quarter. Or the numbers for January & February technically show another increase, yet the number of foreclosure sales thus far are actually consistent with the two previous quarters. This goes to show we can make numbers say whatever we want if we’re not careful. A Key Factor: However, there are definitely more foreclosure listings, which is exactly what we’ve all been seeing on MLS. For context, the past two quarters in Sacramento County each had about 210 foreclosure sales, and there were 139 bank-owned sales in January & February combined. But there are a total of 157 foreclosure listings and 157 foreclosure pendings on the market right now. If these properties end up closing escrow and others continue to hit the market at the same pace, we could see a difference in sales volume in coming time. No Tidal Wave: We’re not talking about a tidal wave or avalanche increase here, so call off the troops and don’t sound the alarms. But do be aware of some movement stirring in the foreclosure scene. Paying attention to the trends helps us better serve our existing clients and it can help us see who our future clients are going to be. I hope this was helpful. Questions: What are you seeing out there in the market? What are you hearing from clients? If you are a real estate agent, are you doing more REO BPOs or taking on more REO listings?